I reluctantly observe that very large cruisers have replaced the barges along the Danube. They have their own particular bulky cargo that is decanted at points along the way. The towns and villages adjacent to the berths have spikes of activity as the visitors arrive en masse. 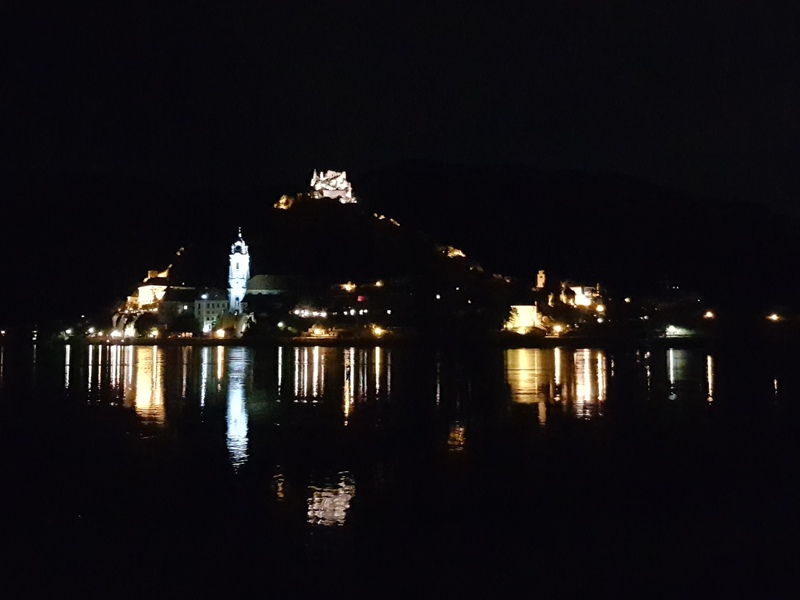 So it was with Dürnstein, across the river from our campsite at Rossatz. It looked gorgeous at night illuminated, but the central area at peak time is congested. There are gift shops galore. And plenty of attempts at flogging of the local wine. We did find a bakery for breakfast, but even parking the tandem safely and out of the way was a bit of a task. Incidentally, just a little way out is a cyclists’ cafe, probably a better option. We’d also been advised that the path on the north side was really nice. We can confirm that the south is probably better through Mautern rather than Krems. Krems has a historic western approach, but once the path reaches the prison (which riders cannot miss), then it is downhill from there. The path is incoherent and actually quite difficult to follow. 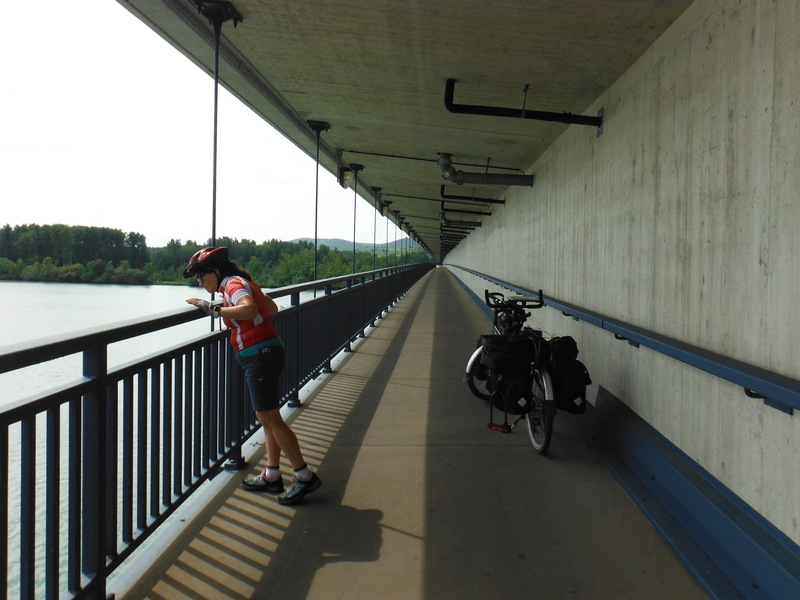 We took the first post-Krems opportunity to cross the river back to the southern path over a relatively new bridge in the direction of Wagram where the cycle track is built under the roadway (right). We think we were right to revert to the southern path. We found ourselves in a riverside restaurant at Traismauer, suitable for lunch. Then all very quiet until Tulln which is quite a resort. There is a camping site, a live stage floating on the river and a multi-activity park. As well as a bakery, naturally. It is also, as we noted, at the end of the S-Bahn to-and-from Vienna. It might not be a bad place to base oneself. However, we decided to go further to Klosterneuburg which is very much a suburb of Vienna. Another 20kms further and, by this time, we were feeling it. 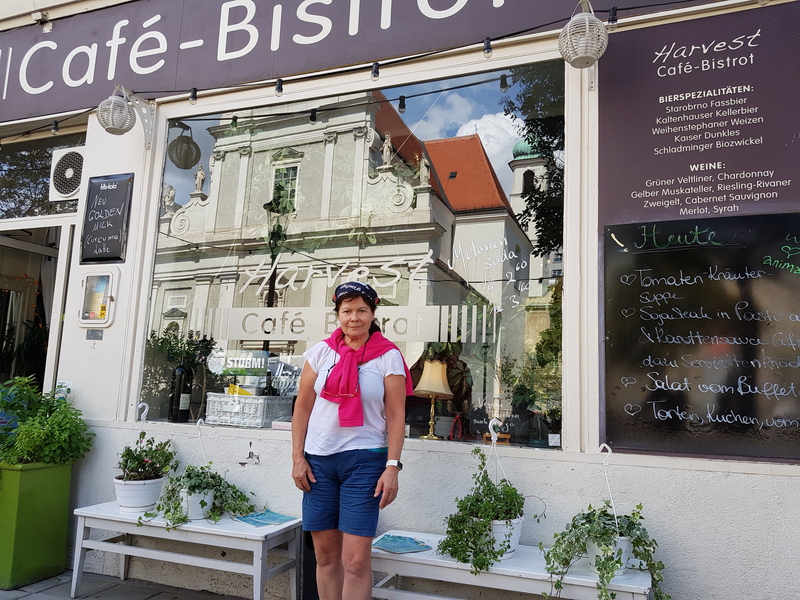 But Klosterneuburg has a great camping site, frequent trains to Vienna, and its own very particular brand of restaurants and cafes (including an icecream parlour where ridiculous quantities of icecream are loaded onto a way-too-small wafer cornet). It is fun to watch and delicious to eat. But impractical. We took two days out in Vienna. The tickets by train to – and around – Vienna currently cost €9.30 (taking in trains, Underground, tram and bus). We visited a cafe that we had failed to get in during previous visits; namely Harvest (above left). 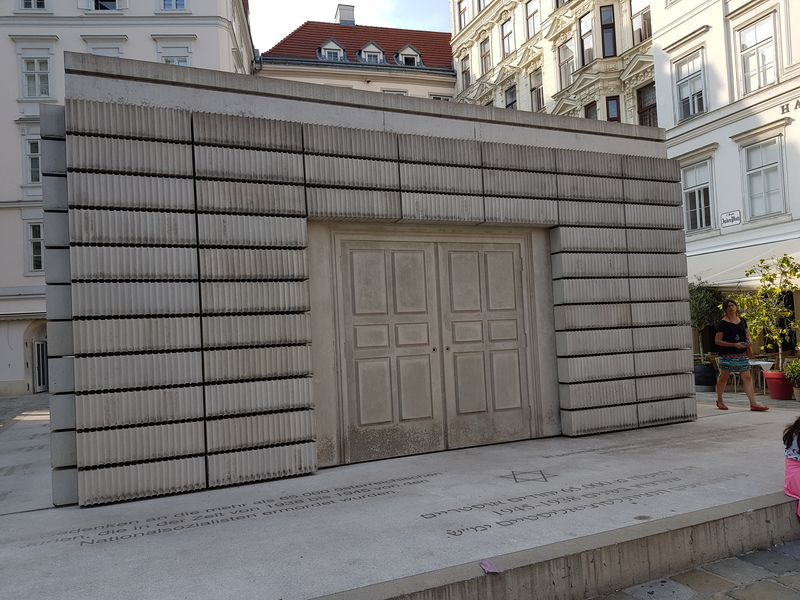 We also visited the Jewish quarter and came across Rachel Whiteread’s holocaust memorial (right). A signature concrete construct with books to symbolise both knowledge and, of course, the Nazi penchant for book burning. It is fitting and just-about works. All of the Nazi death camps are listed around each of the four sides. Chastening. Vienna is truly a gift for anyone interested in architecture. 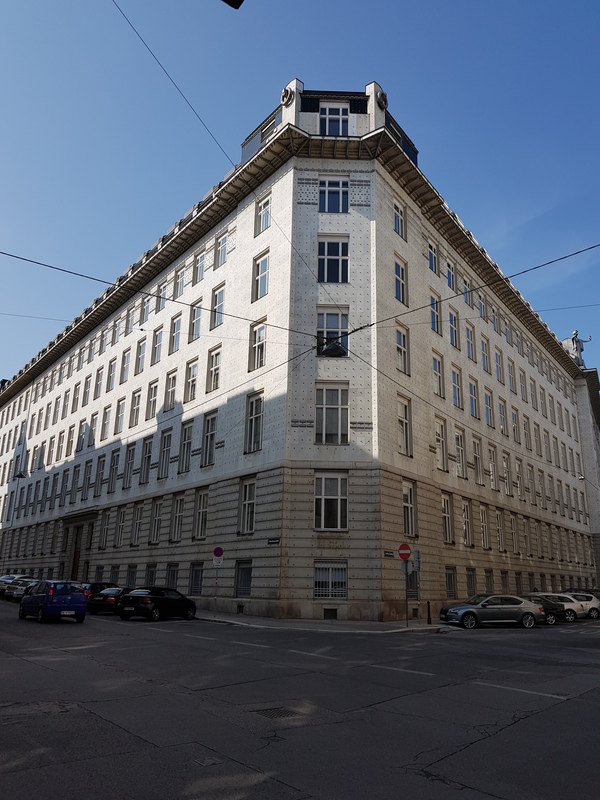 Whilst there are plenty of examples of imperial architecture associated with the Habsburgs, there is also quite a bit that is – and was at its time – rather challenging (particularly to the establishment). But eventually became accepted and then celebrated in the city. Take, for example, the Postsparkasse (left) built in 1904-12 by Otto Wagner. It is an imposing building and is not fancy apart from very small nodules being placed perfectly in vertical and horizontal lines. To see them, readers will need to click on the photograph and then enlarge. It should not work, but it does. Wagner’s art nouveau and modernist architecture is not in short supply in the city. Wagner was a founder member of revolutionary artists’ association, Vienna Secession. I suspect our next visit will take in all of these buildings in turn. Apparently we will be hunting down a number of residential properties, railway stations (U-Bahn) and the Danube Weir. The Postsparkasse is, clearly, not art nouveau, but apparently it is a masterclass in modernist interior as well as exterior. Seemingly everything from radiators, counters to desks and door handles are worthy of note. For readers wanting to get back to Munich, we can report that the operator of the rail route between Vienna and Salzburg (Westbahn) does not accept tandems. So we had to come back with OBB and Deutsche Bahn via Leoben. Not the most direct route, and certainly not cheap. There is dedicated cycle space, however. It was wonderfully scenic. The ride in to Vienna to get to Hauptbahnhof took about an hour. 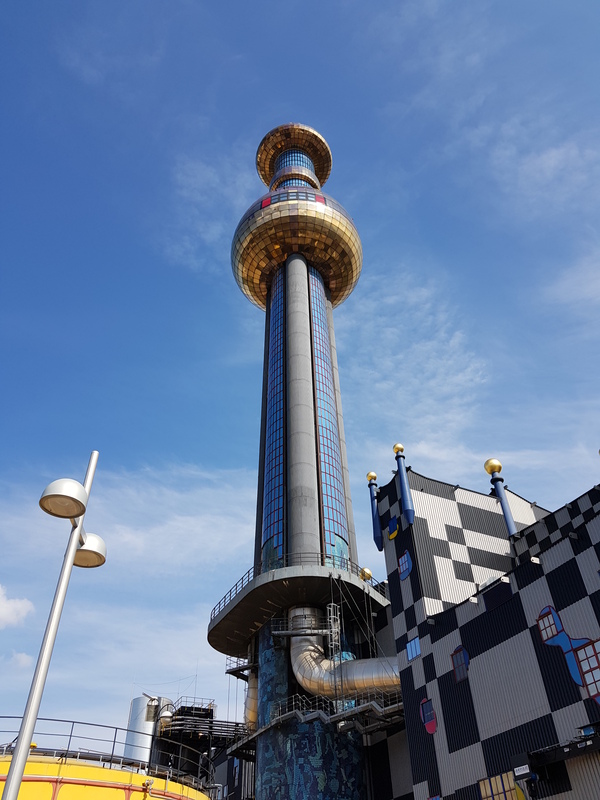 The path takes riders past Hundertwasser’s power station (right) and then further along the Danube canal to Schweden Platz. From there one needs help as Hauptbahnhof is not well signposted. We resorted to Google Maps.